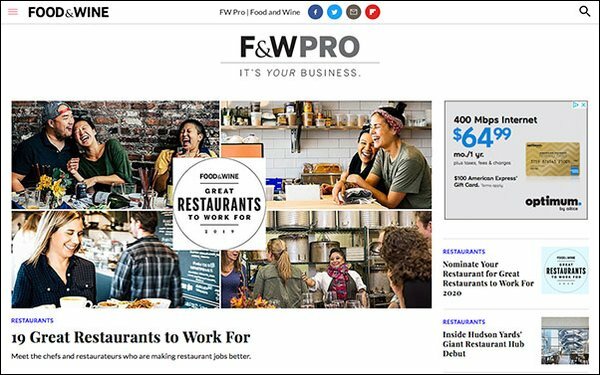 To deliver insider content to food and beverage industry professionals, Food & Wine has launched F&W Pro. The new content hub features daily business news, a weekly newsletter from Food & Wine EIC Hunter Lewis, a podcast called “Communal Table” and special invites during hallmark events, such as the Food & Wine Classic in Aspen, Colorado. The new hub targets people working in the food and beverage business, showcasing industry leaders and best practices. New content will be distributed across FoodandWine.com, social media and events. It will also appear in Food & Wine, starting with the July issue. Features include the inaugural “Great Restaurants to Work For” list, posted on F&W Pro’s home page. The list honors 19 restaurants in the U.S. that offer strong workplace cultures, such as financial transparency, maternity leave, health benefits and mental health counseling to staffers. The list was reported by investigative journalist Tracie McMillan. In addition to new stories, F&W Pro will follow Lewis as he completes a month-long residency in California this summer. He will engage with notable farmers, chefs, winemakers, restaurateurs and hoteliers, sharing recipes and itineraries to recreate the experience. F&W Pro launched with various new advertisers, including Beringer Vineyards. There has been positive response from ad partners, notes Food & Wine publisher Tom Bair, who stated they were “looking to support and develop meaningful relationships with the trade community." Food & Wine is owned by Meredith Corp.